We make Carbide Wire Guides. 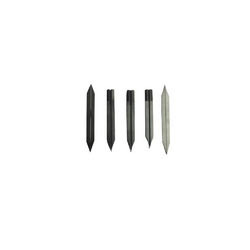 These are used in spring manufacturing machines. We use good wear resistant grade Carbide for these wire guides. We make carbide Quills and Wire Guides used in spring machines. We have been making these wire guides, wire feed rollers and quills for different kinds of spring machines. Beside the manufacture we are giving effective and timely delivery of our products. These products made on the basis of various quality parameters to ensure superior quality and efficient work result. Our products are known for their dimensional accuracy and compact designs are available in different sizes. In the manufacture we are using latest technology and efficient hands. They are durable and cost effective. Looking for Carbide Wire guides ?